Have you ever wondered how much illegal drugs cost? Here's your chance. Last week, the FBI busted the Silk Road website, a massive black market that specialized in the anonymous sale of drugs. But a month before the feds shut down the highly secretive network, a computer savvy Australian startup called The Price Geek harvested data on the two most popular items for sale on Silk Road: cocaine and marijuana. The Price Geek prides itself in being the go-to website to find the price of anything. So, naturally, illicit drugs seemed like a good fit. 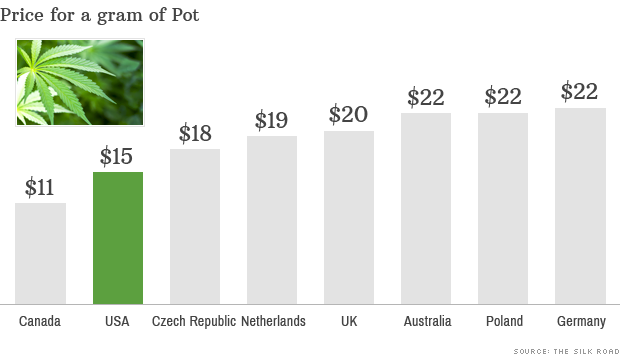 Marijuana was -- by far -- the most popular drug for sale on Silk Road. That's no surprise, given that 147 million people -- about 2.5% of the world's population -- consume cannabis every year, according to the World Health Organization. Prices on Silk Road were set in bitcoins -- digital currency that's hard to trace. For simplicity, we've converted them to their value in today's U.S. dollars. Of the most popular nations, it's cheapest in South Africa. It's most expensive in Germany, but Poland and Australia are close behind. It's relatively affordable in the United States. Why the stark difference? It's still deemed illegal by most governments, but enforcement -- and priced-in risk to dealers -- differs greatly by country. Marijuana has been decriminalized in just a few regions, such as the Netherlands. But legalized pot only exists in only two locations: Colorado and Washington (though it remains a federal crime in the United States). Of the biggest supplier nations, it's cheapest in Peru. It's most expensive in Australia. Once again, it's relatively inexpensive in the United States. That Peru sits at the bottom of the list should come as no surprise. In 2012, Peru bumped off Colombia and became the world's No. 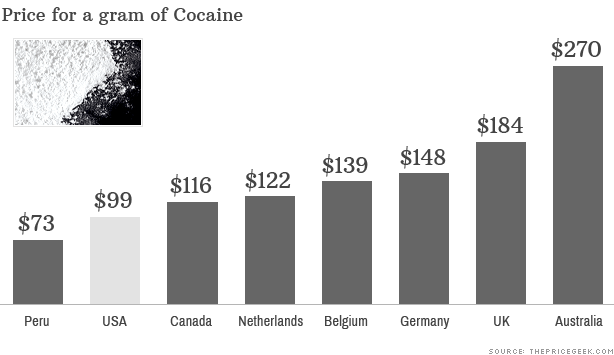 1 source of cocaine, according to the United Nation's Office on Drugs and Crime. An estimated 149,251 acres of coca were planted there last year. Dean Magee, co-founder of The Price Geek, said marijuana and cocaine made up more than half of what was sold on Silk Road. The FBI claims that malicious software and other drugs, such as ecstasy and LSD, were also trafficked there. But Magee said a sizable portion of the site's forums were also filled with "random paintings and PDFs on how to make a bomb." Don't expect any price data on those.